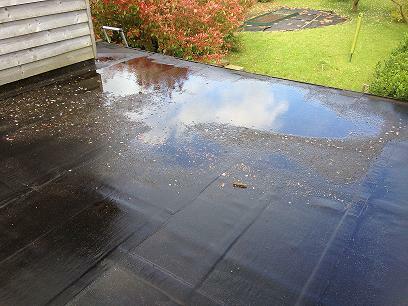 Do you have a flat roof that is experiencing ponding water? Is an area of your flat roof sunken in and holding water? 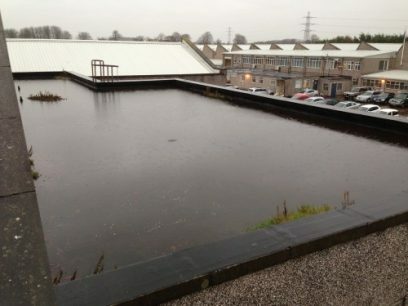 Ponding water is often seen as a threat to a flat roofing system. There are guidelines laid down that designers can follow to design the roof with a drainage fall (gradient) of 1:40. At this design fall, normal construction tolerances can be accommodated resulting in a typical finished level of 1:80. For single ply membranes, this should be adequate to freely drain the roof area as lap joint build-ups are minimal. It should also be added that IKO Polymeric manufactures membranes that are unaffected by ponding water and they will not prove detrimental to the performance or life expectancy of the roofing system. However, best practice should always prevail and the roof should be capable of being free draining. It should be noted that the ponding areas may be affected by a build-up of silt which may be deemed unsightly in addition to which it may prove to be a health and safety issue to any person walking on the roof. During colder conditions ponding water is likely to ice over; with algal or silt build-up the surface of the roof can be treacherous to walk over. When upgrading or refurbishing a flat roof area steps can be taken to eliminate existing areas of ponding. When a roof surface suffers from zero or negative falls tapered insulation provides an effective and economical solution. Tapered insulation provides a gradual low slope to the roof surface, providing positive rooftop drainage. When properly installed, it can eliminate past issues with drainage, collected water, algal growth and unsightly areas of accumulated silt. Is tapered insulation only suitable for refurbishment projects? What are the benefits of tapered insulation over traditional construction practices? Creating falls with timber firrings can be very complex to install where cross falls are required. There is also the potential for condensation risk within voids formed by the firrings. Drying times for screed to falls systems are generally 60+ days and further affected by ongoing inclement weather, modern construction project practices endeavour to speed up process rather than introduce dead time which prevents progress and can be costly. In addition, standard sand and cement screed weigh approximately 2 tonnes/m3. The weight of tapered insulation systems vary depending on insulant type. However, all are significantly lower in weight than screeds. The weight of tapered insulation, using a rigid polyisocyanurate (PIR) insulant, is typically 32kg/m3 and using the relatively heavier rock mineral fibre, the weight is only up to 180kg/m3. Tapered insulation offers a huge benefit by reducing additional weight on structures. The insulation boards can be easily cut on site to accommodate even the most complex of roof shapes or rainwater outlet positions. Factory cut pre-mitred hips and valleys are available to make this process even easier. IKO Polymeric are happy to offer advice on whether tapered insulation offers the correct solution either for refurbishment projects or new constructions.